Sailing's 2017 World Cup Series Final reached its mid-point on Thursday, as sailors continue to fight for position across the ten Olympic and Open Kiteboarding events in Santander, Spain. The competition in Santander has been ferocious with Olympic medallists, World Champions and many of the world's leading sailors aiming to reach Saturday's live Medal Races and to be in with a chance at claiming a medal. Thursday's racing saw exceptional sailing conditions across all the racing areas. An 11-16 knot breeze, gusting 25 knots, tested the sailors. 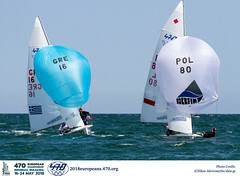 Stu McNay and Dave Hughes (USA) pulled themselves firmly into contention in the Men's Two Person Dinghy, 470, after a day that featured two race wins. The victories put them within sight of leaders Panagiotis Mantis and Pavlos Kagialis (GRE) and two points off David Bargehr and Lukas Mahr (AUT). 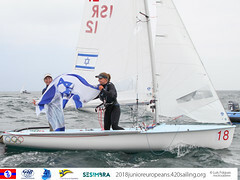 In the Women's 470 fleet, Hannah Mills and Eilidh McIntyre (GBR) snapped up their third race win of a week and followed with a second. 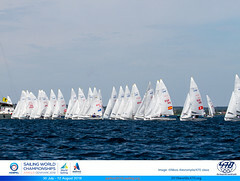 They lead on seven points, five clear of Afrodite Zegers and Anneloes van Veen (NED) who won the day's other race. Racing and action shots plus interviews in English and native language will be available throughout World Cup Series Final. Medal Races on Saturday 10 and Sunday 11 June will be streamed live on World Sailing's Facebook and YouTube Channel.